Tamarillos are available in red or gold. The red tamarillos are often called “black” and are the most popular variety available in the produce stores. Red tamarillos have a very smooth, inedible skin. They are shaped like baby eggplants and grow in clusters of three or more. They have an apricot-like luscious flesh with tiny black seeds. This variety is great for cooking. The gold coloured tamarillos are encased in a smooth golden-yellow skin which is also inedible and like the red variety; they come in clusters of three or more. They are shaped like eggs and they are sweet tasting. Gold tamarillos are preferred over the red variety for making preserves. A good source of vitamin A and vitamin C, tamarillos are low in calories. One-half cup contains about 50 calories. Eating five daily servings of fruits and vegetables lowers the chances of cancer. A recent study found eating nine or ten daily servings of fruits and vegetables, combined with three daily servings of low-fat dairy products, effectively lowered blood pressure. Can be eaten raw or cooked: jams, relishes, sweet and sour sauces, in salads. Ripen tamarillos at room temperature. Keep them out of direct sunlight until they yield slightly to pressure and are fragrant. Refrigerate ripe fruit in a plastic bag up to a week. Look for tamarillos that are plump and heavy for their size with shiny, smooth skin. Avoid ones that have soft spots or wrinkling. If you are planning to use tamarillos in your cooking, they will require peeling because they have a bitter skin which is high in tannins. You can use a sharp peeling knife, a vegetable peeler or you can immerse the tamarillos in boiling water about two minutes; plunge into ice water and then pierce the skin and it will slip off. Tamarillos are versatile and they can be served as a fruit or a vegetable with their tart tomato flavour. 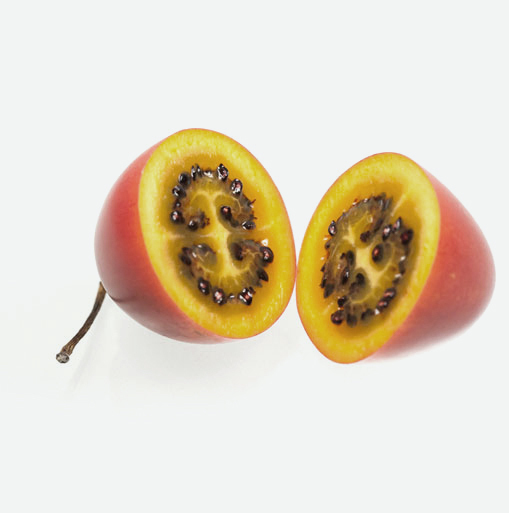 Try marinating tamarillo slices in your favourite dressing and then add them to salads. Soak slices in honey a few seconds; serve on pudding, yogurt or ice cream. Serve with whipped cream or use tamarillos as condiments with spicy curries and meat. Raw or cooked tamarillos yield a delicious jam, relish and sweet and sour sauces.